The works of art in my possession were not purchased with a view to selfishly enjoying them; for, believing that collections of good pictures serve as educators in art and tend to foster a refined and healthful taste, I have freely opening my gallery to the public. Philadelphia industrialist William B. Bement wrote this in the dedication of an elaborately illustrated catalogue of his art collection and the homes where it was housed, which is part of Winterthur Library’s rare book collection. Cover, Catalogue of Works of Art, with Illustrations and Descriptions; Also, Views of the Summer and Winter Homes, Etc. 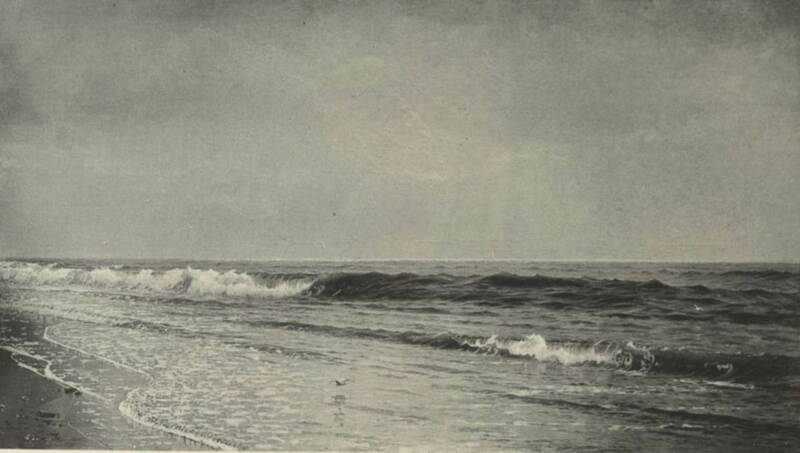 of William B. Bement (Philadelphia, 1884). Yet, as a counterbalance to this insistence on public spirit, Bement also stated that the catalogue was made so that his far away family and friends could: “see the evidence of my success in life, the direction of my tastes, and the sources of enjoyment provided for myself and family in our declining years.” He made sure the illustrated work included images of his homes and commercial operations. In Bement’s estimation, the collection served simultaneously as evidence of personal wealth and his civic largesse. 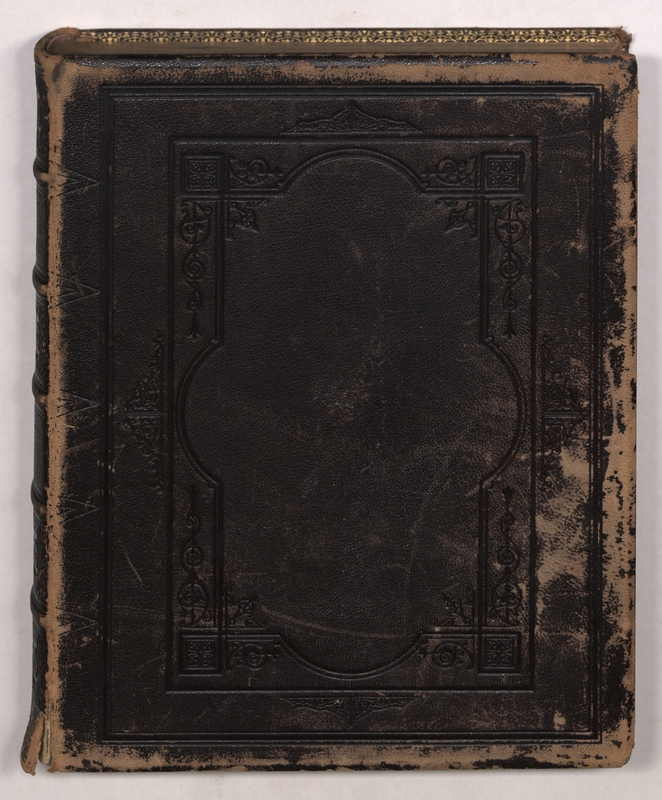 As a dissertation fellow, I worked with materials in the rare books collection—such as Bement’s catalogue—to study how nineteenth-century collectors’ socio-economic backgrounds affected their tastes for art, as discussed in Part 1 of this blog post. Why do scholars need to know about collectors’ decisions and what motivated them? The production of art can—like any other good—be at least partially explained by the economic theory of supply and demand. Collectors constitute demand and their preferences have a formative effect on the art that artists can sell and therefore choose to create and supply. 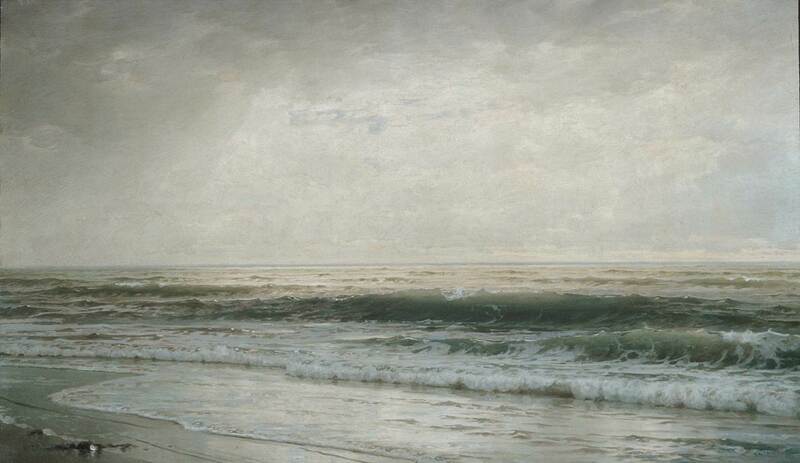 Understanding demand for art in the nineteenth century can help scholars understand how and why artistic styles took a certain form during this time. While there are several theories (e.g. those by Thorstein Veblen and Pierre Bourdieu) about collectors’ motives more generally, there is limited available evidence about nineteenth-century collectors. Bement’s catalogue is, therefore, a valuable source. The Philadelphia businessman’s decision to select Charles Callahan Perkins to write the catalogue text—to praise and contextualize the collection—is a telling choice. Perkins, unlike Bement, was born into an established family with significant wealth. A Boston Brahmin, he attended Harvard and studied art in Paris and Rome after graduation. He later dedicated his life to writing about art and advocating for its support in the United States. He was central to the incorporation of the Museum of Fine Arts in Boston and helped bring influential art and design treatises—such as Charles Locke Eastlake’s Hints on Household Taste —to America. The art critic supports this assertion with—on average—lengthier and more enthusiastic descriptions of the American paintings in the collection. 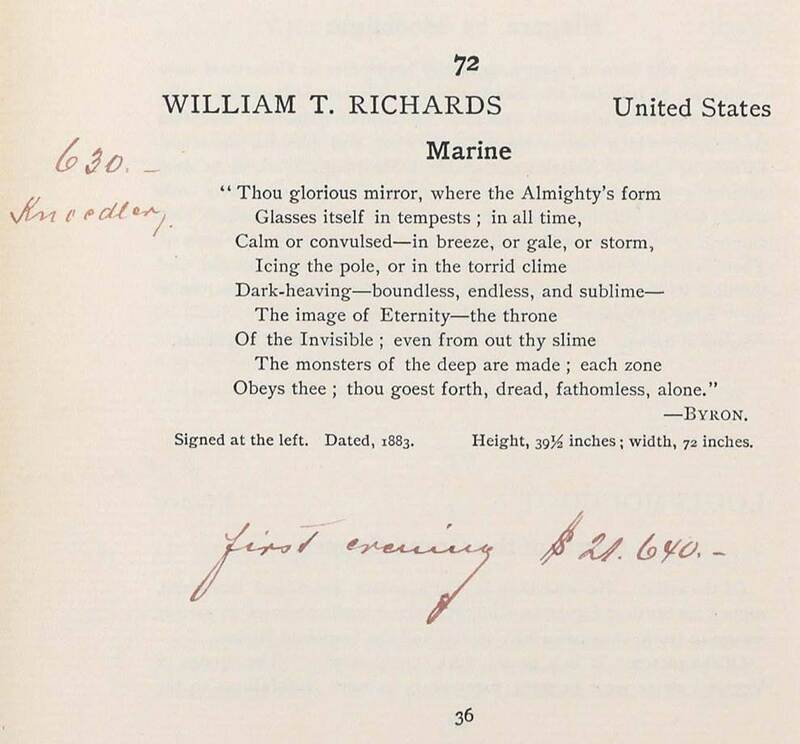 Consider the text dedicated to a marine painting by William Trost Richards similar to one now in the Metropolitan Museum: “This is the sea itself—no painted likeness.” It continues along these lines for half a page until concluding with an extended quotation of a Lord Byron poem beginning: “Thou glorious mirror, where the Almighty’s form/Glasses itself in tempests; in all time.” This depiction of the sea invokes God’s own creation, and the implication of Perkins’s rapturous description is that Bement is doing God’s work by acquiring beautiful objects. Ironically, despite Bement’s love for his collection and his professed belief in its importance for the public good rather than just private enjoyment and gain, he did not bequest his art to any institution. The collection was sold soon in 1899—two years after his death. The auction catalogue still exists from the sale held by the American Art Association in New York. Any art that ended up in public collections—such as William-Adolphe Bouguereau’s The Cherry Picker in the Walters Art Museum—had to be bought at auction. According to annotations in the auction catalogue, the art dealer Michel Knoedler purchased the marine painting by Richards. Detail of Page 36, Valuable Modern Paintings, The William B. Bement Collection (New York: American Art Association, 1899). Its current whereabouts are unknown. With his art collection scattered, houses long since demolished, and company absorbed into a large conglomerate, the only remaining evidence of Bement’s success in life, tastes, and “sources of enjoyment…in [his] declining years” is this catalogue. As a result, it is within the walls of the Winterthur Library that the detective work into gaining insight into the past and understanding the 19th-century art collector’s mind can continue. This entry was posted in Academic Programs, American Culture Studies, art collections, Library, Paintings, Prints, Photos & Drawings, rare books, Uncategorized and tagged art collection, library, rare books, Winterthur Library, Winterthur Museum Garden & Library. Bookmark the permalink.